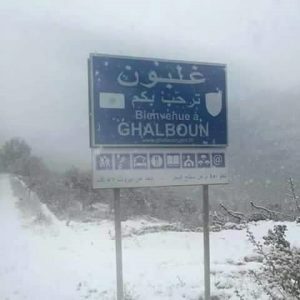 Ghalboun resides in Jbeil district at an altitude of 500 meters, surrounded by Ain Kefaa, Ghbalin, Beja and Hakel, Aabaidat, Shamat, Hsarat and Maad from the west. The etymology of the word Ghalboun is Syriac-Aramaic, meaning “Albona” or strong and tough. It was mentioned in the Holy Bible under Albona’s name; meaning sword in Syriac according to the historian Anis Freiha. Ghalboun includes numerous antiquities most importantly the cemeteries that are located in the area of “Al Hosh”, that go back to five thousand years BC. Ghalboun has many grottoes from the stone age in which human bones, pots, urns and tombs made from red sand were found, emphasizing the Phoenician traditions and their presence in that area. The people of Ghalboun built a church on “Al Hosh” hill and named it Saint Fawka. It goes back to the Byzantine era and it’s all what’s left from the big monastery that was built back then. On its ruins the people of Ghalboun built a church that was renovated several times. Whereas the current Cross church was relocated in 1882. It goes back to the fourth Benzatine generation and was destroyed by the Mamluks. Back then the church’s location was 10 meters away from the current one and thanks to the help and determination of the region’s people, this church was built and the Cross street was named accordingly. Ghalboun’s population accounts for 1500 with 155 residences. The majority of its people are employed in the public and private sector, while the minority works in the agricultural sector. Ghalboun’s crops include almonds, olives, vine, figs and all types of fruits and vegetables that grow in middle areas.